In the drive to ensure a holistic involvement of stakeholders of the educational sector in the fight against corruption, the Independent Corrupt Practices and Other Related Offences Commission (ICPC), in collaboration with National Association of Proprietors of Private Schools (NAPPS) held a mass launch of Students Anti-Corruption Clubs (SACs) for private schools. At a ceremony which took place at Titsal Global Schools, Abuja, and had private schools drawn from Niger and Nasarawa States as well as the FCT in attendance, the Acting Chairman of ICPC, Dr. Musa Usman Abubakar, who was represented by Mrs. Azuka Ogugua, Assistant Director, Education, expressed his profound appreciation to the membership of NAPPS for their decision to collaborate with ICPC in the setting up of anti-corruption clubs. He acknowledged their effort in getting involved in the anti-corruption fight saying: “this indeed is an expression of your collective resolve to shun corruption, challenge lack of integrity and propagate the gospel of integrity”. Dr. Abubakar, explained that “students’ membership of anti-corruption clubs will create the desired value reorientation in them which will in turn build a better generation of youths for the nation. For this reason, ICPC saw the need to engage stakeholders in the education sector, not only in the public schools but also in private schools through collaboration with NAPPS”. Describing corruption as an ill-wind that blows no one any good, Dr. Bolujoko expressed optimism for the fight against the scourge. 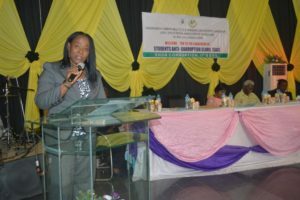 She said “I have no doubt in my mind that corruption in this country will be significantly curtailed or completely eliminated given these steps that ICPC is taking.” She therefore called on the Commission to provide member schools with all the necessary campaign materials and logistics to make the anti-corruption awareness drive a success. The occasion attracted proprietors of schools, religious leaders and other dignitaries including the former Chairman of ICPC, Mr. Ekpo Nta.